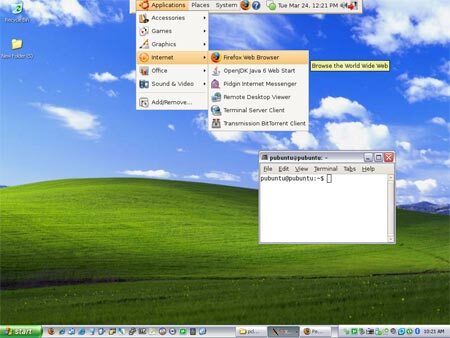 Portable Ubuntu Remix for Windows (Pubuntu) is a project headed by Claudio Cacsar Sa¡nchez Tejeda that uses CoLinux (Cooperative Linux) to enable a user to run Ubuntu on top of Windows. CoLinux, a port of the Linux Kernel, is an open source virtual machine that works much like Qemu (some claim it is faster). Ubuntu is a fork of Debian, and a product of Canonical Ltd. In the following tutorial, we will show you how to install and run CoLinux Portable Ubuntu from a USB flash drive or other portable device, all while you're still up and running in Windows. Notice the top edge Ubuntu panel or taskbar in the screenshot below. Note: We are not affiliated with Ubuntu or the CoLinux Portable Ubuntu project.